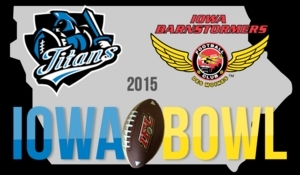 DES MOINES – The Iowa Barnstormers will participate in the first-ever “Iowa Bowl” Saturday, February 28, 2015 in a road game versus the Cedar Rapids Titans. Kickoff is scheduled for 7:05 p.m. at the U.S. Cellular Center. The Iowa Barnstormers will play their inaugural Indoor Football League (IFL) game on February 28 versus new in-state rivals, the Cedar Rapids Titans. The 2015 “Iowa Bowl” will be a home-and-home series and will include a traveling Iowa Bowl Trophy. The second portion of the “Iowa Bowl” will occur on Saturday, May 16 on the Barnstormers home turf in Wells Fargo Arena. The Iowa Barnstormers return to Wells Fargo Arena for their home opener on Saturday, April 11th. The Barnstormers will be celebrating “Date Night” with a special ticket package good for two tickets, hot dogs, and beverages. This package is valued at $66.00, but is now being offered for $50.00. Call the Iowa Barnstormers at 515-633-2255 to order yours today!